Create your own flavored water, naturally, with this 16 oz. 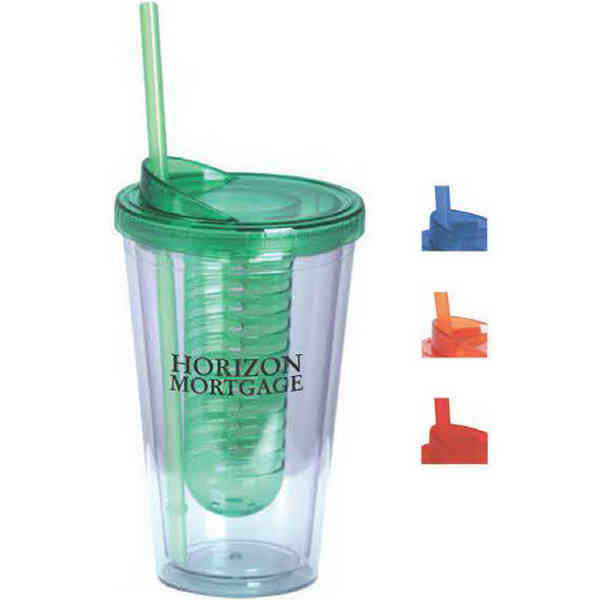 double-wall, acrylic tumbler with fruit infusion basket, screw-top lid with drink-thru opening for straw (included). When filled with fruit, the infusion basket changes the beverage flavor, and the double-wall insulation keeps cold beverages at a consistent temperature. BPA free. Standard imprints listed. Maximum imprints possible for additional charge. Dimensions: 3 7/8" Dia. x 6 3/4" H.